Do you have the insurance coverage you need or are you paying too much? Find out now. If you don't have life insurance, or you haven't reviewed your coverage in a while, request a complimentary insurance policy review with an M&T Securities Registered Representative at your local branch. Has your coverage kept up with the changes in your life - such as a birth, marriage, divorce, new job or new home? Talk to us about protecting what matters most to you. within one business day to schedule an appointment. 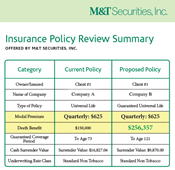 This insurance policy review service is offered at no cost to M&T customers and you are not obligated to purchase insurance from M&T Securities, Inc. as a result of this service. A review may indicate that your insurance policy is performing as intended and that you should continue to review it on a regular basis. If this review reveals any under performance or other challenges, your policy review report will contain specifics and we will explain what their impact might be. Your policy review report may also offer options to address the specific challenges uncovered by the review. Your M&T Securities, Inc. Financial Advisor can assist you in exploring those options or you are free to explore them with any other financial professional you choose. Brokerage services and insurance products are offered by M&T Securities, Inc. (member FINRA/SIPC) not by M&T Bank. M&T Securities, Inc. is licensed as an insurance agent and acts as agent for insurers.